The Sachin Must Retire Flowchart! 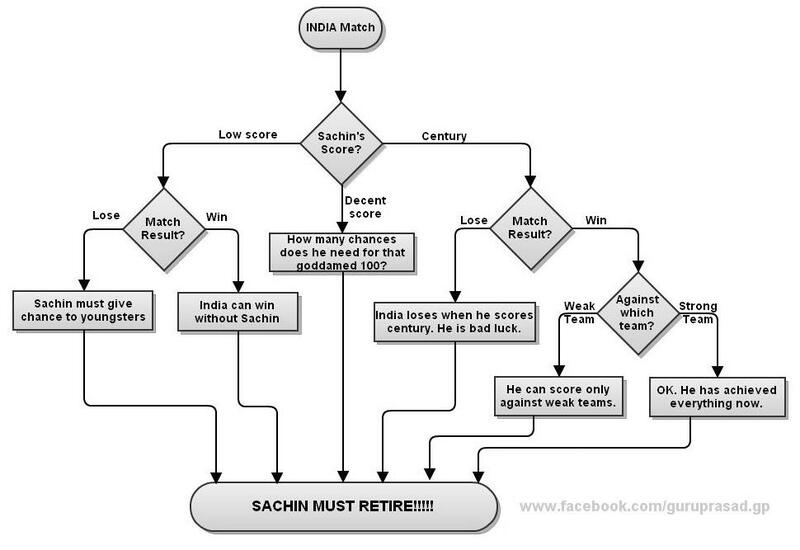 Posted byAditya Kane	 March 20, 2012 2 Comments on The Sachin Must Retire Flowchart! After Sachin Tendulkar completed his 100 international centuries there have been a lot of people praising his achievement. But I have noticed that over the past few years a lot of cricket fans seem to criticize Sachin Tendulkar for whatever he does or does not do. Most of this criticism expects Sachin Tendulkar to retire and a flowchart created by Guruprasad Gp has nicely explained, how some critics obsess over Sachin Tendulkar’s retirement. Every time the critics hits Sachin, he gives his best. and time to retire, he must think on his own. I don’t think its the time he calls quits now.